You can warn users if they do not abide by the rules. For example a text of a user can contain illegal links. 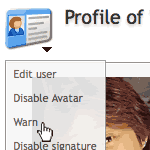 Users can be warned where the violation happened if you find a warn button there. Otherwise you can warn them in the user profile. Just click on the profile icon to open the moderation options. When sending the warning you can choose from predefined warnings or create an individual warning. Specify the duration of the warning and how many points it should have. The points from the warnings sum up so if they reach a certain level the user will be penalised (e.g. locking the user's signature). Infractions can only be defined by the administrator.